The in-game add-on began as a homebrew Bejeweled clone from Michael Fromwiller, cleverly titled Besharded. desist, the casual gaming colossus hired Fromwiller to create a more polished version of the application. The screenshot shows ‘Bejeweled’, not ‘Besharded’. So did PopCap effectively inject their own title into WoW? What I mean is: yeah, it’s cool that they hired this guy and giving him legitimacy rather than squashing him like a bug — even though they would have every right to — but if the end result is that they ‘took over’ his hack/app then I think that’s a pretty shrewd move as well. 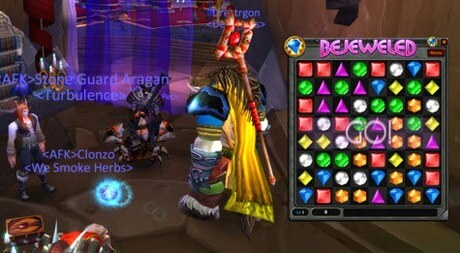 Yeah, they turned it into an official version of ‘Bejeweled’ within WoW. Hm, consider the legal / business implications… WoW as a casual games platform? I’m seeing a game called Scrabulords………………. All they need is to tie this into the leveling system and they’ve got a really good version of Puzzle Quest.